Cr 58-65% Si 4.0% Max C 8.0% Max P 0.05 Max S 0.05% Max Size 10-150mm (90% Min ) or as per required. Being a customer oriented organization, we are deeply engaged in offering a wide array of Ferro Chrome Lump. Kay Bee Industrial Alloys (P) Ltd. Backed by rich industry experience and market understanding, we are involved in offering a wide array of Ferro Chrome to our valued patrons. 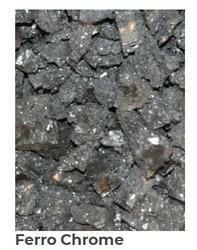 We offer ferro chrome of different grades based on the carbon composition such as LC FeCr, MC FeCr, HC FeCr. Milan Ferro Alloys Pvt. Ltd.